As a mother of the bride or mother of the groom, finding just the right dress to wear on your son or daughter's big day can be a big challenge. Although many retailers and designers that carry bridal gowns also carry bridesmaids dresses and flower girl dresses, it seems that mother of the bride or groom gowns (also known as "MOB" dresses) are often forgotten from wedding fashions. Read our 2011 Mother-of-the-Bride Dresses in Vancouver market guide, instead. When you do find a designer or retailer that carries dresses specially styled for the mother of the bride or groom, the selection can sometimes be scarce. And if you'd prefer not to wear the standard shapeless pastel shifts with draping shawls that seem so common to mother of the bride or groom gowns, the following fashions offer a classy, contemporary change of pace. Laval bridal boutique, La Belle Mariee carries several stylish selections for the mother of the bride or groom, including these figure-flattering frocks and matching jackets. Laval's La Belle Mariee also carries a number of plus-sized mother of the bride or groom dresses in contemporary styles such as the above number, available in sizes 6-26WP. 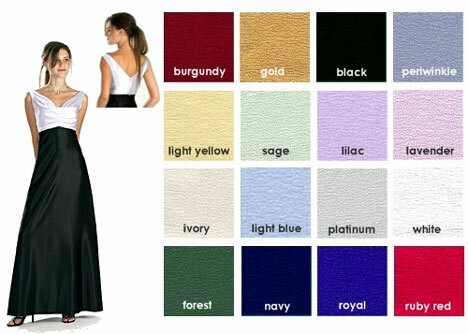 Vancouver's Paradise Style Group carries mother of the bride or groom dresses available in a wide selection of colours, such as this satin-crepe piece with elegant empire waist and wide shoulder straps. 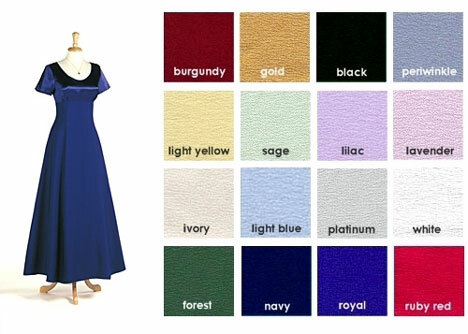 Shown here in royal blue, this mother of the bride or groom gown also from Paradise Style Group in Vancouver, features a scoop neck which flatters every figure, as well as a slimming empire waist and A-line skirt. Toronto's Bella's Brides carries mother of the bride or groom gowns from the Mori Lee collection, including this exquisite number shown here in gold. Also available in turquoise and black, this dress comes with a matching satin shawl. Bella's Brides also carries beautiful mother of the bride or groom gowns in plus sizes, such as this taffeta design, which features beading at the bottom and a sophisticated wrapped waist. From online bridal boutique, Keli Bridal comes this sleek mother of the bride or groom gown with matching shawl. The sweetheart neckline and texture on the bodice add a uniquely elegant element. Keli Bridal also carries this stunning retro-style mother of the bride or groom dress, featuring a Queen Anne neckline, gathering at the side-waist, and matching jacket. Alfred Sung features a few select gowns for mothers of the bride or groom, including this strapless style (no.276) in silk shantung with 3/4 sleeve jacket.